I'm home! Somehow I managed to miss another snow storm and be in the heat instead (while that may sound great I actually love the cold and am so sad that I haven't been around. For the last storm I was in Florida, seen in this Life Lately post). 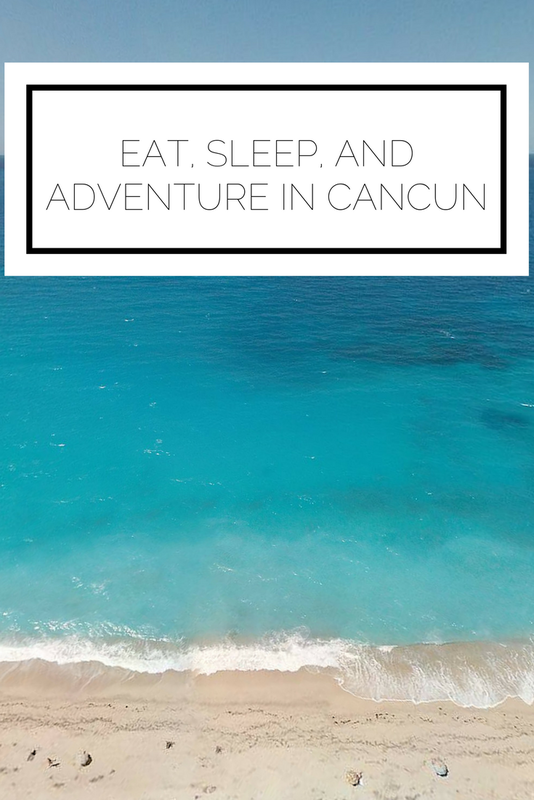 Today I wanted to share with you my advice for where to eat, sleep, and explore in and around Cancun. I don't have a ton of photos because I am usually taking video now for my seasonal compilations (you can check out my YouTube channel here), but I'm including everything I have. The video including Cancun will come after graduation in May! Ok, we're going to start off with the most important category first: food. Since this is a spring break college trip, budget was very important to me so I kept that in mind with all of my food choices. On the first day when we arrived we walked to a grocery store where I picked up big jugs of water (although the hotel water would most likely be safe, I didn't want to take any chances), bread, fruit, peanut butter, jelly, bread, pasta, sauce, and chips. This fed me for breakfast and lunch throughout the entire trip (and only cost $24) and then we went out for dinner each evening. On the first night we went to what turned out to be our favorite place, Tacos y Tequila. The tacos were great, the servers were friendly, and the prices were just right. In fact, all of the meals we had were reasonably priced so that helped out my poor wallet. On the second night we wanted to have a fancy meal so we went to an Argentinian steak house called Cambalache. This meal was expensive ($40+), but the atmosphere and service were to die for. On the third night we went to Lighthouse and once again it was good food for a good price. It was only two doors down from Tacos y Tequila so we got a good sampling of what was in the area. For the fourth night we went to El Fish Fritanga that was the cutest place by far, but my least favorite food. On our final night we went back to Tacos y Tequila because we loved it so much! I never get tired of Mexican food so this was a dream for me. Most dinners were around $10-$15 so you really can't go wrong. I'm going to double up on this category because for sleep I can only account for the one place we stayed haha. My friend Tina's parents generously allowed us to use their Westin Lagunamar timeshare and it was a lovely place to stay. Once again, I took a ton of video but not a lot of pictures so you'll have to tune in later to check it out. We spent a great deal of time on the resort property, so of course I had to find ways to occupy myself like with swimming and yoga! In terms of getting around, when you first arrive at the Cancun airport and walk outside you will be met with tons of cab and shuttle companies trying to get your business. While I was able to negotiate with the cab driver to get a better rate, it would have been better to coordinate a cab through the hotel ahead of time. Also, make sure you bring a lot of cash with you that you can convert into pesos at the hotel. The rates were best there, but the ATM fees were astronomical so you'll want to avoid those. When it came to getting around Cancun we either walked across the street where all of the restaurants were or took the city bus. Cancun is just one long strip so the bus is wicked easy. You can hop on at any stop, pay a dollar, and get off wherever you want. While drinking and lying on the beach is the main draw to Cancun, there are certainly other things to check out. I chose to go on an excursion to see Chichen Itza, one of the 7 wonders of the world! I booked the excursion through the hotel (I thought this was the safest option and was only $79) and left at 7am for one heck of a day. My guide Jesus was phenomenal and I was surprised to find that most of the people on the tour only spoke Spanish, there weren't too many Americans at all. This made it a bit tough to make friends, but I did find some later. Our first stop was a Mayan village that had some authentic elements, but was more of a tourist trap than I would have liked. 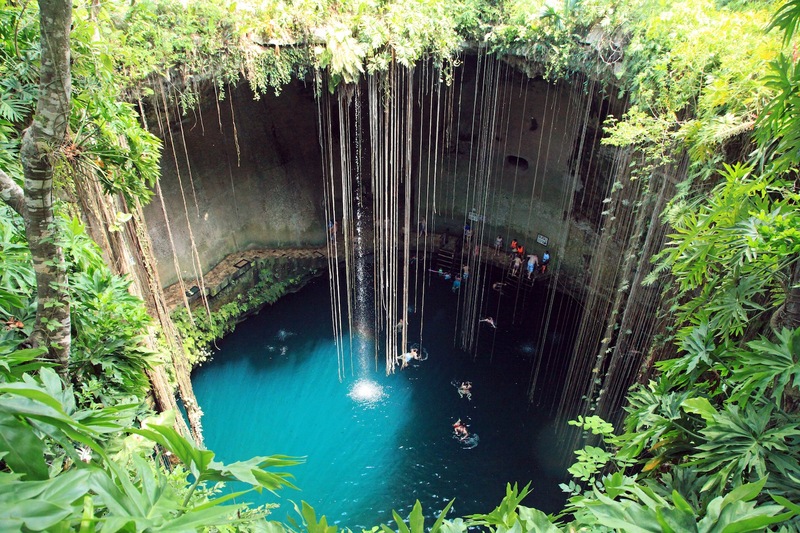 The second stop was swimming in the breathtaking Cenote Ik kil. The sinkhole was incredibly deep and beautiful and it was quite a magical experience and I felt like I was in a movie. I also got to partake in lovely meal (with flan dessert!) before getting back on the bus to head to the main attraction of Chichen Itza. Oh. My. Goodness. This place was so amazing. It was built by the Mayans and is thousands and thousands of years old. We were separated into Spanish and English speakers so I finally got to make some friends :) After we saw the main sights, we were set loose on the property (fun fact: only 12% has been excavated so there is a lot to explore and so much more to be discovered) and I met two sweet girls from Missouri and their mother. We had a ton of fun walking around and I appreciated how inquisitive they were, just like me! After departing Chichen Itza we drove through the city of Valladolid and it was quite quintessential. I would love to go back and experience it on foot so that will be a stop for another time. Another draw to Cancun is the nightlife. 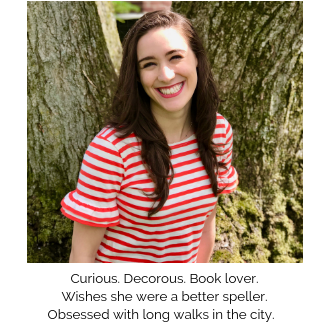 I only went out one evening (as you'll know if you're a long time reader, I don't drink) and it was amazing. We went to Señor Frog's and when we walked in we ran into my darling friend Nina and I was so very happy. I danced the night away, and even fulfilled one of my dreams of dancing on a bar! Taking the city bus back was a bit of an adventure, but in a group you're just fine. So there you have it! Those are the highlights of my trip and some advice for your trip if you find yourself heading to Cancun. Have you visited before? Any tips? Any plans to go to Cancun?